50 years on since the last soldiers left, we look back at the Swindon army base which helped win two world wars - and welcomed the first American GIs to Britain. Very little remains of Chiseldon Camp today which could give any hint of the fascinating story behind its existence or its role in the making of British history. It was a key training facility and staging post for soldiers bound for the First World War, and then the story was repeated during the Second World War. And there is an intriguing addition to the plot in the fact that it was the very first camp in Britain to receive American soldiers, thus providing a page in a chapter of American history. The camp had its own railway station and hospital, its own recreations, it played host to royal visitors and a legendary entertainer, it provided the people and the setting for some intriguing and tragic incidents - and it even has its own ghost. Originally called Draycot Camp because it was close to Draycot Foliat, its Chiseldon postmark ensured it would soon become known as Chiseldon Camp instead (and even Chisledon Camp as the alternative spelling of the village persisted well into the 20th century). Chiseldon was a town that had been transformed by not one railway but two. Firstly, the opening of a major manufacturing and engineering works on the Great Western Railway at Swindon in the 1840s, three miles away, saw houses built for railway workers at Chiseldon, from where they would commute daily. Then, in the early 1880s, Chiseldon got its own station and goods yard on the new Midland and South Western Junction Railway (M&SWJR) which provided the missing link between Southampton and Birmingham - connecting the south coast and Britain's industrial heartlands in wartime. 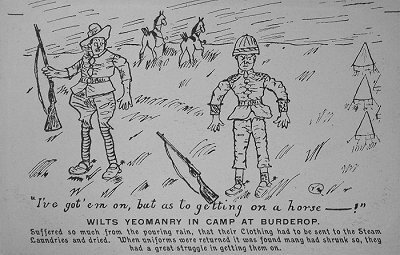 But location wasn't everything when choosing where to site camps following the outbreak of the First World War. 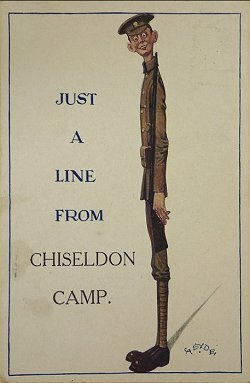 Chiseldon already had some military connections before the Great War as Burderop Park was the site of annual camps and manoeuvres which took place on the Calley Estate. Nobody realised it at the time, but the landscape would eventually provide a useful setting for soldiers who would need to be trained in the new discipline of trench warfare, with the surrounding downland providing some imitation of the battlegrounds of Belgium and France. But it was its strategic location and communication links that most caused the land to be requisitioned very early in the war and purchased by the War Office in 1915. The camp was to be almost due south and almost in the shadow of Chiseldon, within sight of both the M&SWJR line and the main Swindon to Marlborough road, the A345. 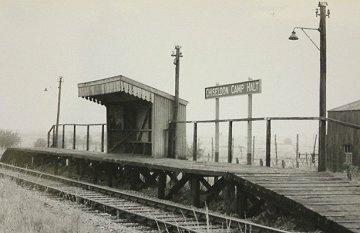 The M&SWJR was only a single line, so a new spur was taken off it, starting from just south of Chiseldon station and running parallel with the existing line until it branched into the camp and terminated at a wooden later concrete - platform, known as Chiseldon Camp Halt. 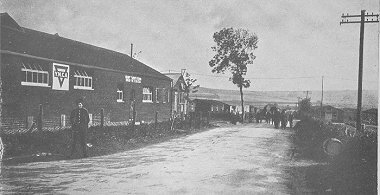 The first 72 buildings - each 50x20 feet and with room for 30 men - were begun in September 1914 by Chivers of Devizes, between the Swindon-Marlborough road and the main railway line (east of the eventual camp) - and were called L Lines. By mid-October 1914, just two months after the outbreak of war, the railway line was already complete, along with telephone links from the camp to Chiseldon and Ogbourne, but it would be some time before these were ready for occupation. 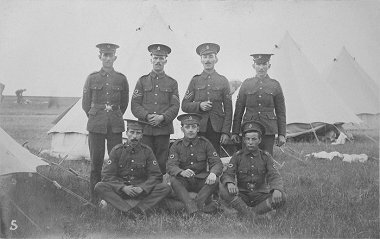 The first arrivals - a battalion from Cheshire and three from Wales - slept under canvas, even though the fields were unsuitable for tents because they were low-lying and therefore wet. So it was a relief for some when the first of the wooden huts, with their corrugated iron roofs and asbestos linings, were finally opened. Even then, most soldiers still slept under canvas and other facilities were tented, including the YMCA's marquees which provided recreational facilities. A new contract was drawn up for 72 further buildings in October, this time with H&C Spackman of Swindon, while furniture, such as beds and lockers, was made by Gilbert's of Newport Street, Swindon, who set up a workshop at the camp. Although licensing restrictions were necessary to combat the ever-present temptation of alcohol for the off-duty soldiers, relations with the local people were generally excellent. Local people took in visiting relatives and sweethearts, and links were made with many local churches, which provided recreational facilities and refreshments. Concerts were arranged by and for the recruits. One local minister, Rev John Gavin, of Trinity Presbyterian Church, became a camp chaplain and later followed the 15th (Scottish) Division to France as their chaplain. As the camp grew, a hospital was established in June 1915. Until then, the Red Cross had set up a makeshift hospital at the GWR swimming baths in Faringdon Road, Swindon, but this closed as soon as Chiseldon's hospital opened. The camp's hospital received a steady supply of wounded and sick men because of the continuous shelling and sniping of trench warfare, but rates became much higher during specific campaigns and pushes, starting in late 1915 with the Battle of Loos. 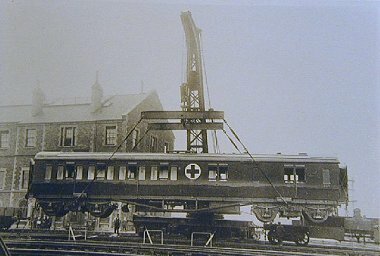 Many casualties were transported by ambulance trains built by the GWR in Swindon, after returning to Britain via Southampton Docks. 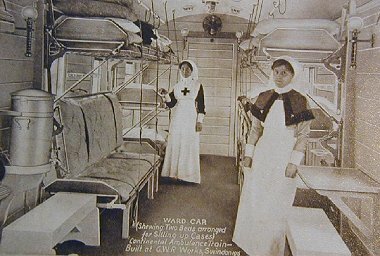 The hospital had six wards of 24 beds each, and a total of 40 nurses. Four further wards were later built, so the capacity was 240, although this was often supplemented with tents, sometimes doubling capacity. Meanwhile, the platform at the camp's halt was altered to be able to accommodate motor ambulances. Once they were sufficiently recovered, patients were discharged to makeshift auxiliary hospitals such as the one established at the Stratton Workhouse. 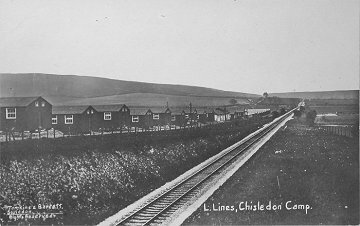 Another, less conventional hospital was established at Chiseldon in L Lines in July 1917. Whereas the rest of the camp was open, with no perimeter fences, a public road and bus routes running through the centre of it and there were very little restrictions on comings and goings, this new hospital was separate from the rest of the camp and surrounded by barbed wire - not to keep people out but to keep patients in. It was reserved for patients suffering from venereal disease, which the authorities were desperately struggling to contain. Eventually containing more than 1,100 beds and known in the local area as the 'Bad Boys' Camp, there were many instances of patients breaking out from this unit and heading for Swindon, especially the brothels of the Newport Street and Morley Street areas. Old Town and New Swindon! Another feature of the camp was a shanty town of wooden buildings which were turned into canteens and shops. This grew up to the west of the site and became known as Piccadilly. A picture palace was even erected at Draycot Road by Alfred Manners, owner of Swindon's Empire Theatre. Although he was no doubt taking advantage of a commercial opportunity, Manners was also well known for raising money for charity, so would have been driven by a genuine desire to help with the war effort. Unfortunately, the picture palace didnt last long because of the weather which was undoubtedly the defining aspect of life at Chiseldon Camp in its early days. The picture palace was destroyed by a severe storm on December 1, 1914 - the worst night of the bad weather that marred the autumn and winter of 1914/15. On the same night, tents were flooded and some soldiers were put up at the village hall instead. More bad weather followed, including blizzards, leading to outbreaks of flu and tuberculosis which caused the death of several men. This time, some troops were transferred to Cirencester to alleviate the situation. Despite the weather, work pressed on with the building of A, B and C Lines where buildings were of asbestos sheets on wooden frames. Though later notoriously cold and damp, they were still a vast improvement on the conditions the camp's first inhabitants endured. Soon there were 12,000 men in training at Chiseldon, including many from Scotland and some of the British Army's most celebrated regiments, such as The Black Watch. However, around half were still having to be accommodated in tents. At this stage, there were plans for part of the camp to accommodate cavalry, but the unforeseen changes to the nature of war and in particular trench warfare, meant there was more demand for infantry, and facilities such as stabling and harness rooms were never built. When they were finally completed, huts were self-contained units for whole battalions of 30 men and a junior officer, and each line had its own cook house and canteen, plus a Regimental Institute for recreation, which usually included a small library. Each pair of lines shared officers' quarters. After the completion of the A, B and C Lines, work continued on the D, E, F, G and H lines, with each area linked by reinforced concrete roads themselves an innovation for the era. But there was much more to Chiseldon than barrack blocks. From the early days, a rifle range was constructed to the east of the camp, below Liddington Hill, with 52 targets and firing points at various distances. Training of infantrymen took just 15 weeks - compared with the 18 months allowed in peace time - so there was a quick turnover of recruits going through Chiseldon. They all learned important lessons about modern warfare, gaining an introduction to what to expect if they were posted to the Western Front, thanks to training trenches which were specially dug on the other side of the main Swindon-Marlborough road. 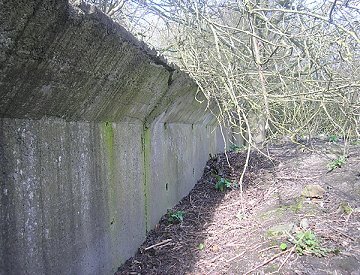 A full-sized trench system was built between 1915 and 1917, just south-east of Lower Upham Farm. There were also several small trenches dug at various points inside the camp itself. These were mainly for practice at throwing Mills bombs, a kind of hand grenade which was designed to explode shrapnel into enemy trenches. Both dummy and live bombs were used. Throughout the camp, trenches were also constructed as practice in trench digging, and two of these produced archaeological finds - a Bronze Age barrow and a Roman skeleton. 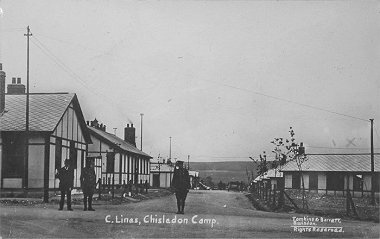 During 1915, the YMCA tents were replaced by a large wooden hut, and other facilities were opened in Chiseldon itself, to provide entertainment and recreation for the soldiers. Many soldiers stationed at Chiseldon made a big impact on and mostly endeared themselves to the local community. A high proportion of recruits to Chiseldon in the early days were from Scottish Regiments, but the camp eventually saw soldiers drafted in from regiments in Gloucestershire, Hampshire, the Midlands, Kent and London, as well as Australians and Canadians. 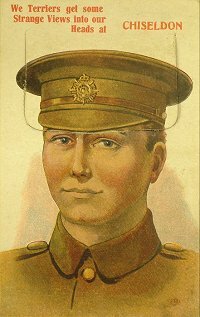 But August 1915 - exactly a year after the war began, saw the arrival of the battalion who made the biggest impression - ironically because they were the smallest in stature. The 17th Battalion Royal Scots - known as The Bantams - were each between five feet tall and five feet, three inches. Previously, this would have disqualified them for military service, but in trenches their height proved a benefit. 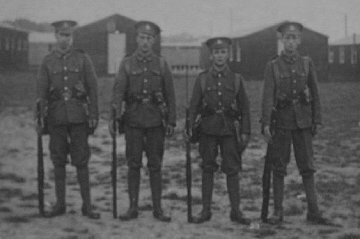 In Swindon, where they were often seen on foot patrol, they were made all the more conspicuous by being accompanied by taller sergeants who struggled to keep in step with them while marching. Their training complete, the Bantams left for France in February 1916. 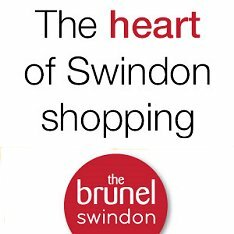 However, they had ceased to be a familiar sight on the streets of Swindon from November 1915 when an outbreak of scarlet fever put the town out of bounds to soldiers until March 1916. It was during this period that conscription - as opposed to the recruitment purely of volunteers - was introduced. Just as unusual as the Bantams were the cyclist corps, who began to arrive at Chiseldon in 1915. Mainly concerned with defending Britain - and especially coastal areas - in case of invasion, they were trained in fieldcraft and explosives. One of their main duties would have been the disabling of transport links if it was necessary to delay the advancement of the enemy. 1916 - by which time the corps' role had changed and retrained men had been dispatched to India, while others were used in France in communication duties. They gave displays of their skills locally, including picking up wounded men from the ground without dismounting from their bicycles. The camp was also used by Canadian and Australian cyclist corps. The latter part of 1917 saw the running-down of the camp as recruits began to dry up, although territorial units were brought in to the vacant lines. German prisoners of war were also brought in during 1917, staying in H Lines and doing manual work in the local community, especially on farms. Following the armistice, Chiseldon became a demobilisation centre which managed the carefully controlled release of men back into the community, processing up to 10,000 men a day. South African, Australian and New Zealand troops were also billeted at Chiseldon while waiting to return home. Once demob was over, many of the huts in the camp were auctioned off, but A, B and C lines were retained and became the School of Military Administration. This trained senior NCOs and officers in transport operations, logistics and other skills, including catering. However, by the end of 1923, the school was being run down and the main use of the camp was for territorial units¹ summer camps and mock battles. In 1927 the Army Vocational Training Centre was moved to Chiseldon from Catterick in Yorkshire - and from then until 1939 the camp trained regular soldiers for a return to civilian life. Courses included engineering, building and even chauffering and boot repair. Some students were also trained in agriculture, and a 600-acre farm was leased from the Calley estate for this purpose. The farm was home to several former army horses which had been 'pensioned off' after the First World War. The camp also housed a large number of working greenhouses which supplied food to army NAAFIs, and with their carefully maintained gardens, parts of the camp came to resemble a small country estate. Not only serving soldiers came to the camp for training. One scheme run by the Ministry of Labour in 1928 trained unemployed ex-servicemen and their wives who were emigrating to Canada as farmers. Another course trained coalminers. The setting up of a small catering school and the arrival of the 1st Motoring Training Battalion of the King's Royal Rifle Corps were yet more pleasant interludes before the camp was back on a war footing in 1939. 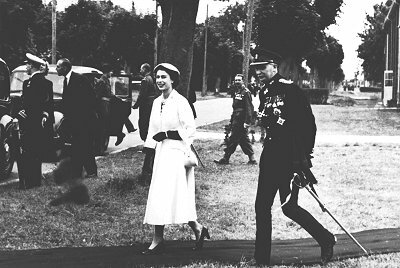 On March 29, 1940, King George VI took tea in the Officers' Mess after carrying out inspections - his daughter, Queen Elizabeth II would visit in 1954 - and by now, regular regiments were receiving training at Chiseldon. It was also used as a collection point for men returning from the evacuation of Dunkirk. One role of the camp was to provide facilities for staff manning a decoy that was set up on Liddington Hill. The decoy was a set of oil fires which would be set alight to draw any second wave of bombers away if a first wave had attacked the local area, especially the Swindon Railway Works. The idea was that the second wave would mistake the fires for the flames of targets hit in the first wave. In the event, large scale attacks on the area never came and the decoy was never required. In an echo of First World War activity at the camp, two bombing ranges were created for training purposes, where live hand grenades were often used. 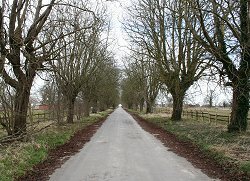 The local countryside was also utilised for combat training, especially Pinkcombe Woods and Lower Upham Farm, close to the site of the network of practice trenches created during the First World War. On the roads around Wroughton, Avebury, Aldbourne and Hungerford, many soldiers posted to Chiseldon learned to drive a variety of vehicles, from motorcycles to trucks and mobile bren guns. Signallers and despatch riders were also trained in the use of all kinds of communication methods, from semaphore to field telephones and even including carrier pigeons - a squadron of which was stationed at the camp. Nearby Upper Upham House was also used as a military psychiatric hospital. Until 1942, Chiseldon Camp played host only to British forces, but then it became the very first camp to receive American troops, heralding a period that would see US forces concentrated at Chiseldon over the next couple of years. Most of these first 17 volunteers were attached to the King's Royal Rifles Corps, before regular American soldiers began arriving in late 1942, and they were accommodated in the American version of Nissen huts, on land between the camp and the village. At this time, Chiseldon became closely associated with another camp which was just north of Ogbourne St George, and the two were often administered as if they were a single entity. Although the Ogbourne camp was built to accommodate incoming American soldiers, the first arrivals, in late 1940, were actually Canadians. One of the duties of the Americans while at the camp was to guard Savernake Forest, which was a large munitions dump. With the influx of vast forces, so came the need to prepare for the inevitable consequences of heavy and sustained fighting. Despite large military hospitals at Burderop (the US 154th General Hospital), Lydiard Park (US Army) and Wroughton (RAF), Chiseldon camp also became the site of an American hospital. Built in the spring of 1943, to the north of the existing camp, this included 126 buildings and 750 beds. After it officially opened on October 3, 1943, as the US 130th Station Hospital, most of its early patients were suffering from training injuries, but in June 1944 the hospital became a key location for the handling of casualties arising from the D-Day landings. It was a transit centre, receiving casualties evacuated directly from the battle zone - either by rail or on USAF Dakotas via airfields at Blakehill near Cricklade, Lyneham, Down Ampney and Broadwell Membury. 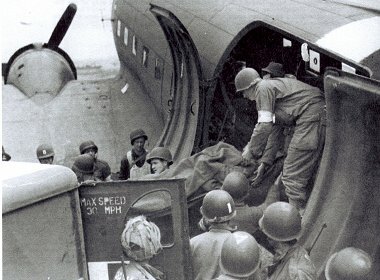 This evacuation couldn't begin until long runways had been established in Normandy, so the first casualties - 455 of them - arrived on 13 June, 1945, 7 days after the invasion began. In the six months between then and January 1, 1945, the hospital received 30,321 casualties from Belgium and France, of whom only 12 died. Later, during Operation Market Garden, casualties from the assault on bridges at Nijmegen and Arnhem were back at Chiseldon within 25 hours, which led one soldier to remark that the transportation was 'like a magic carpet'. One unit which was surprisingly passed over for Operation Market Garden was the 17th Airborne Division, which arrived in Britain on August 25, 1944 and were stationed at Chiseldon throughout their stay. Their training included mass parachute drops into fields near the camp, which produced an unnerving sight for locals. The division finally went into action on Christmas Day 1944, landing in Belgium before fighting in the Battle of the Bulge. 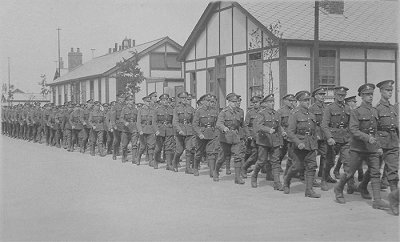 Their departure effectively marked the end of combat training at Chiseldon. 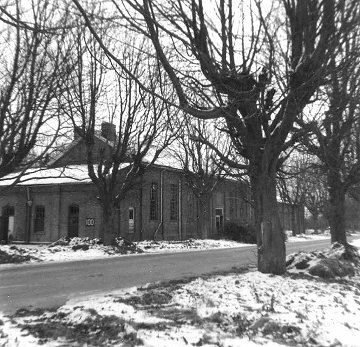 The hospital closed in May 1945, and once peace was declared, the camp quickly became virtually deserted. However, echoing a use for the camp at the end of the First World War, a small number of German and Italian prisoners remained, tending the gardens. These were said to be 'delighted to be prisoners'. Eventually, the camp again became a military educational establishment, firstly preparing soldiers for demobbing - another echo of the post-war role of the camp in 1918. In the same way, the site of the hospital was given over to a unit that briefly allowed exiled Poles to finish their education, which had been disrupted by war. Although the hospital became derelict and its buildings were demolished in 1955, parts of the rest of the camp were still in use. It was used for the accommodation of troops involved in the Suez Crisis of 1956, and in the same year it became a reception centre for refugees fleeing the anti-communist uprising in Hungary. But there was no long-term plan or need for the camp. The last army unit to be stationed at Chiseldon were 22 Regt Royal Engineers, who left in 1962, and the camp was left virtually empty until 1974, when demolition began. 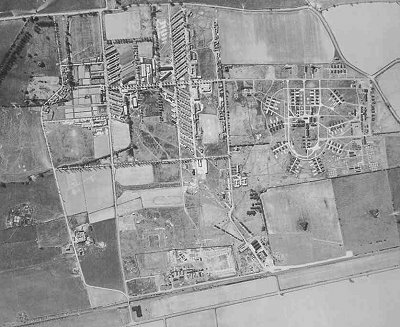 Almost no trace of the Ogbourne camp remains and most of the Chiseldon camp has returned to private land - mostly for agricultural use but some for housing. 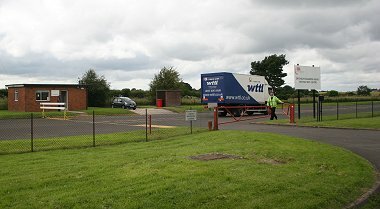 However, telltale signs of its existence can still be found, including the old railway platform of Chiseldon Camp Halt, while the Department of Transport's Heavy Goods Vehicle Driver Test Centre is on the site of the former hospital. the former camp gym in Ladysmith Road. 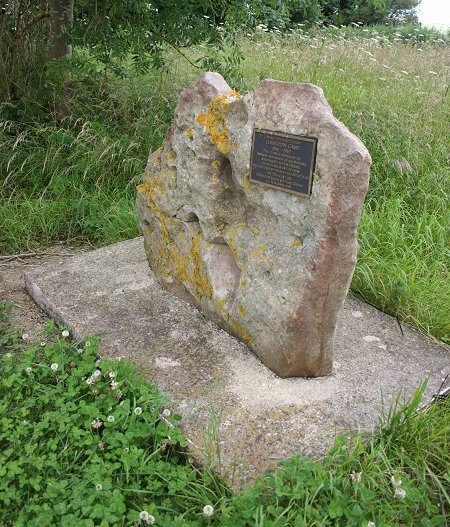 And there has been a memorial to the camp since November 11, 1999, when Chiseldon Local History Group unveiled a sarsen stone with a plaque which simply commemorates the camp's existence. And it seems that at least one echo of the past is refusing to fade away - the camp 'ghost'. Often seen on the road between Chiseldon and Ogbourne St George, he is a figure who carries a gun, has a disabled leg, is always completely motionless with one foot on the verge and the other on the road, looks straight ahead and never shows any reaction to passing traffic. Reports of sightings have been recorded at least between the 1950s and 1980s, including some that were even entered in official logs. No explanation of his identity has been offered, but speculation has inevitably included the possibility that he is the ghost of one of the thousands who left the camp to go to their deaths on European battlefields. But he could be the ghost of any one of literally tens of thousands of men who passed through Chiseldon Camp during extraordinary times. If you do pay a visit to the camp site - most of it now private property, however - this is the only indication you're in the right place - a memorial stone put in place in 1999 by the local Chiseldon History Group. 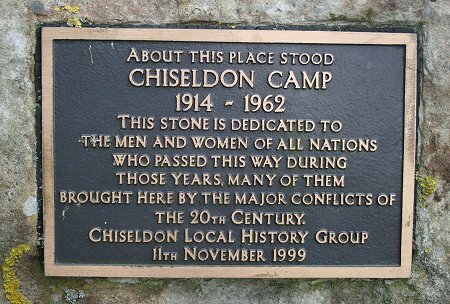 Chiseldon Camp was the setting for countless human tales and tragic stories that were more or less inevitable given that they were played out during two world wars. But there are other incidents that are associated with the camp which don't directly involve warfare but nonetheless had tragic consequences. On April 18, 1919, three boys from Swindon were killed while visiting the area to play. Up to 24 boys had set out for the day, and seven of them began investigating the former trench training area. When one of the boys picked up an object that 'looked something like a rolling pin' it turned out to be a live shell and exploded - killing two 14-year-olds and a 13-year-old. There was a murder at the camp on January 8, 1943, when Private Harold Smith of the First Tank Destroyer Group shot Private Harry Jenkins, three times. Pte Jenkins, a guard, died the next day. Smith was court-martialled and executed on June 25, 1943, at Shepton Mallet Military Prison - by the infamous hangman, Albert Pierrepoint. Troops from Chiseldon were also involved in one of the worst ever road accidents in Wiltshire. On October 22, 1944, a group of American soldiers were travelling from Chiseldon on an open lorry in a convoy, bound for Tidworth. At Leigh Hill, in Savernake Forest, the lorry collided with a coach which was also carrying American soldiers. Ten soldiers were killed and 21 seriously injured. An even greater loss of life occurred on December 12, 1944, when a Horsa glider carrying 31 17th Airborne Division troops from Chiseldon crashed near Newbury, killing everybody on board. The relationship between ordinary British people and American troops during the Second World War is, of course, legendary, and still a source of fascination. 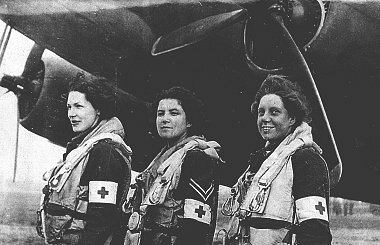 On the whole, the Americans seem to have received a good reception from the local people, and particularly the young girls - some of whom inevitably became 'GI brides'. 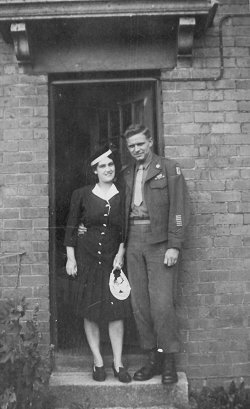 One arrival, Samuel R Marks of the 17th Airborne Division of the US Army, who were stationed at Chiseldon Camp, wrote of his experiences, and his arrival is especially revealing. 'We are finally in a war zone,' he wrote. 'Red Cross girls provide coffee and doughnuts as we entrain. By dawn I catch my first site of the beautiful countryside, neat farms, small villages, with everyone holding up V-signed fingers. We detrained and were trucked to barracks in Chiseldon. We were told these were the same barracks used by the first American troops in England. 'We enjoyed visits with the English families in our vicinity, became more acquainted with the pubs, red telephone boxes, narrow roads and country lanes, the mostly red two-storey buses and the chilly, rainy and foggy atmosphere common in England. We also were able to meet English girls at dances, and to locate someone in the nearest village that would do our laundry for a small price. 'The barracks life included one small round stove in the centre of the room and showers were available, but only with ice cold water. 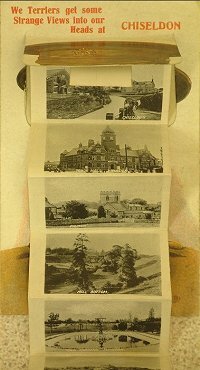 American GIs were famously provided with a handbook which explained some of the issues and peculiarities of their posting to Britain and was designed to help them adapt to the country's lifestyle, but Swindon Council also produced a booklet, called America Gets Around - Starting from Swindon, which provided some more local knowledge, mainly to help with recreation. Meanwhile, the United Services Organisation (USO) organised its own shows at the camp, and these were also attended by local people. At least one of these, an open-air show, featured the legendary film star, comedian and entertainer, Bob Hope.